"Excellent reference source for Adobe Creative Suite 5!!!" 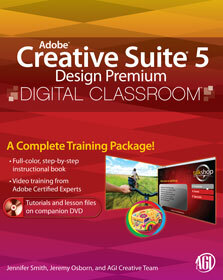 Adobe Creative Suite 5 Digital Classroom is like having a personal instructor guiding you through each lesson, while you work at your own pace. This Creative Suite book with DVD includes 25 self-paced lessons helping you learn essential skills and explore new features and capabilities of the Creative Suite 5 Design Premium applications. Where did Motion Guide layers go? files that use Motion Guide layers? How do I create a motion guide if I still want to? What is a Global Color?